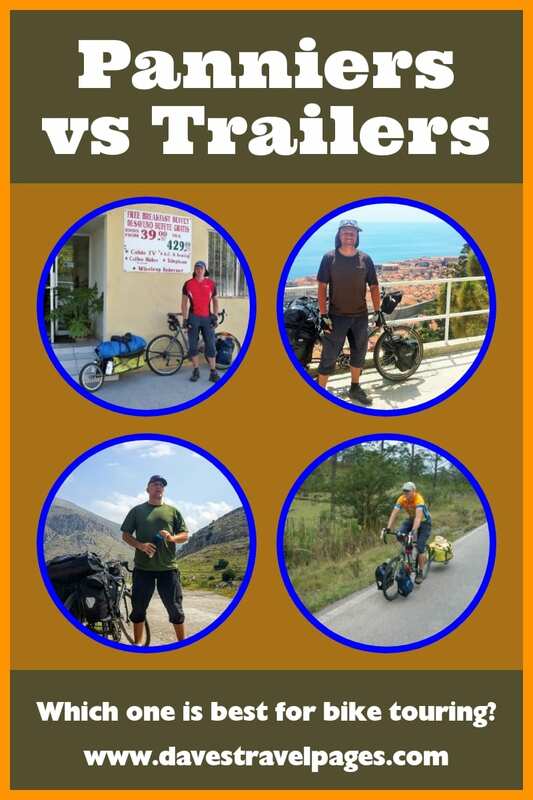 Touring Panniers vs Bicycle Touring Trailer - Which is best? Whether having touring panniers or a bicycle trailer for bicycle touring is best, is an ongoing source of debate among touring cyclists. Which one is best for you? Each option has its benefits and drawbacks, their lovers and haters. 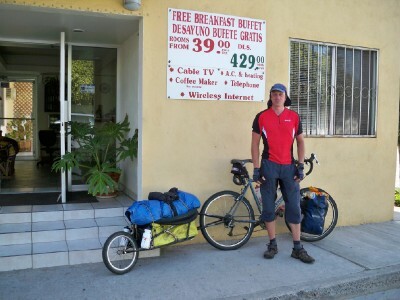 As I have used both set-ups on my long distance cycling expeditions, I thought I would write about my own thoughts and experiences on the subject. You can take it from there! Firstly, as with all my bicycle touring tips I should begin by saying that there is no right or wrong answer to this question. Whether you use one or the other comes down to you and the situation you think you might use them in. Some people even combine the use of both, and tow a full trailer as well as having a further four panniers attached to their bicycles. Personally, this would be a little heavy for me, but each to their own! The vast majority of people use touring panniers when bicycle touring. They are a tried and tested method of carrying everything a cyclist will need on short trips or long expeditions. The traditional set-up will see two large panniers on the rear rack, and two smaller ones on the front rack. Items such as a tent are then often strapped across the rear rack. There are even top rack packs available which sit neatly on the rear panniers and buckle into them. Using panniers for bicycle touring has several benefits, and the foremost of these, is versatility. A weekend tour might only require that the rear panniers are used, whereas a longer cycling trip might require all four and a rack pack. Trailer owners would need to tow the trailer behind them regardless of if the trip was for a weekend or longer tour, meaning that weight was being added to the bicycle unnecessarily. Most cyclists prefer a light as load as possible! Panniers also make keeping things organised and accessible a breeze. One bag might be for food, another for clothes, one for cycling kit and cooking gear, and another for camping stuff etc. Once a daily routine develops, it becomes second nature knowing which pannier to open when certain gear is needed. This is certainly better than opening the large bag that is towed in the trailer, where everything gets mixed up together, and it can become a real pain finding things. Check out my guide to choosing the best panniers for bicycle touring here. Another great thing that I have noticed about using panniers, is that they are a lot easier to carry when it comes to either finding somewhere to camp at night, or booking into a hotel. When wild camping, it is quite possible to lift the entire bike complete with panniers over a small fence to get into a field to camp. This is a lot quicker than unhooking the trailer from the bike, and lifting both trailer and bike over a fence separately. The same can be said when checking into a hostel or guesthouse, and having to take the bike up a set of stairs to the room. It is (just about!) possible to lift a fully loaded bike up a couple of flights of stairs if you are feeling strong. It is always two trips if not three with a trailer, which may seem inconsequential now, but gets irritating really quickly when out on the road! Bicycle trailers come in various guises and designs, although the general theory is the same in that the bulk of a load is towed behind the bicycle. The trailer itself will be designed to contain a large bag, or in the case of one design, panniers on either side of an “extra-wheel”. One of the much vaunted benefits of using a trailer over panniers, is that it puts a lot less stress on the bicycles rear wheel, reducing the amount of broken spokes and even damage to the rear hub. This is due to the way that the weight is distributed, and is certainly worthy of consideration when deciding which sort of touring set-up to go for. The downside to this, is that as there are one or more extra wheels on the trailer, the chances of punctures increase, spare tubes specific to the trailer may need to be carried, and there are extra hubs to keep in mind. Thankfully, broken spokes are a real rarity on quality bicycles trailers such as a Bob Yak Trailer, so spare spokes normally don't need to be taken for them. Another good thing about using a bicycle trailer over panniers, is that the entire “train” is more aerodynamic than when using panniers. I haven't got any figures to hand, but I'm sure that in web-world there is a detailed study into this! Being more aerodynamic should in theory mean that less calories are needed per average day. My experience is that this gain is offset by the overall set-up being heavier. Towing a trailer up steep hills also feels like dragging an anchor behind the bike, but maybe that is all in the mind! Perhaps the main plus on the side of using a trailer, is that it enables you to carry more stuff when needed. Examples of this are if you need to cross a desert region, and have to carry more days food and water than normal. This becomes a real balancing act to get it right on the bike when using panniers, but with a trailer, it is simply a case of piling it on and strapping it. I have to say, that it certainly made my crossing of the Salt Pans of Bolivia a lot easier, and I was even carrying a spare wheel at the same time! Having used both, I can honestly say that I would never go back to using a trailer again! I found the whole set-up inconvenient from day one, when I had to pack it up to fly it out to Alaska, through to the last day, when it acted as an anchor as I pushed my bike through a mud bog. Using the trailer always made everything seem heavier and slower, and on a number of occasions at junctions, motorists came close to hitting me when they pulled out after I cycled by, not expecting the trailer to be there. 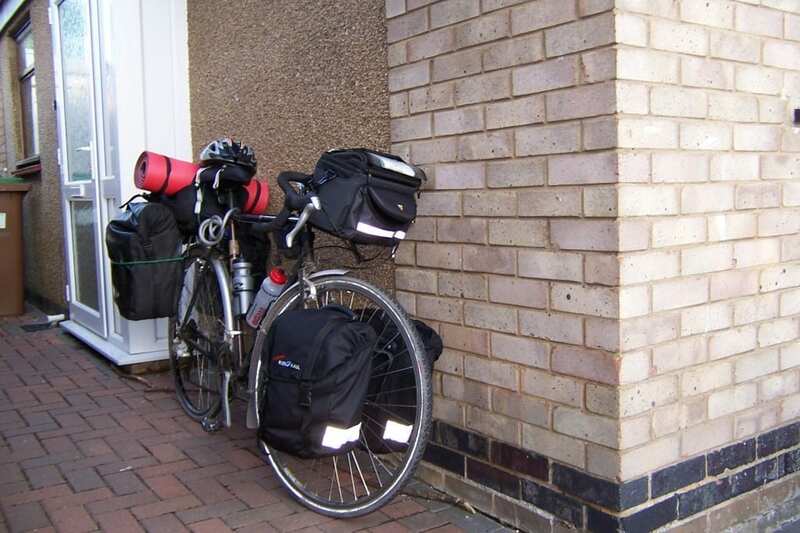 Certainly on my next bicycle tour, I will be using solely panniers, and I am looking forwards to feeling unrestricted, which is something I never did when using the trailer. Do yourself a favour – Learn from my mistakes, and use bicycle panniers rather than a trailer on your next bicycle tour! Having used both on various trips I have to say in the long run I do agree with Dave. Interesting article as I have recently bought a trailer mainly to carry picnics etc for the family on our rides out for the day which I have to say I much prefer over panniers. I recently rode a weekend tour in my home county of Lancashire where we have both flat and hilly bits, I totally agree about the hills, it was hard work going up, on the flat it was great and I did realise it was there, had to keep checking! I getting to old now for grande tours plus getting permission off the wife is near impossible so for weekend away trips and as we are about to do with my youngest (10) a overnight stop over the trailer will be used, I kind of got to like the trailer even on the hills and as we are on the coast the wind resistance plays an important part. Many thanks for your articles. Agreed on Aidy’s point – I recently did the Great Allegheny Passage with my three kids (10, 12, and 14). I was able to put a lot of the heavier gear into my BOB Ibex and then spread the remaining (lighter) gear among the kids’ rear panniers. That way they felt like they were carrying their own gear without having it unduly impact their first bicycle touring experience. I also came across a couple where the husband had a BOB and 4 fully-loaded panniers, while his wife (who said she was an inexperienced cyclist and this was her first trip) was carrying next to nothing. I agree that panniers are better for solo trips, but if you need to carry more than your “share” of gear, having a trailer gives you a lot of extra flexibility! Anytime I think of bike trailers it’s of the assholes who put their kids in those covered trailers. You were mentioning how unsafe it is just for your stuff imagine if you have a child back there, haha. I wonder if they made panniers to stick toddlers in O_O.